August's goals are centered around finishing some projects and to clean my spare bedroom (craft room). Cleaning the craft room is the most ambitious project: the room is crammed with fabric, yarn, and items I have collected for the hospital nursery. I laundered all of the donations, and the items are in sealed bags. Even thought the hospital is limited on storage, I am hoping that they can find room for the items. 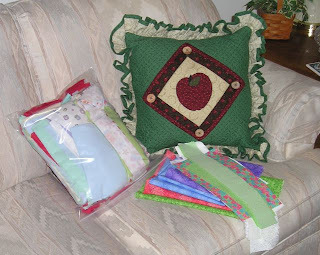 I am going through my scraps and cutting the bits and pieces into standard sizes of squares and strips and sealing them in plastic bags; thus, when I decide to make another quilt, half of the work will be done. The flannel scraps crammed into the bag in the top photo need to be cut and organized. The smaller pile of cotton scraps is just a representation of the chaos that I need to tame. These scraps came from the receiving blankets, burial gowns, and demise pouches I made this past year. I doubt that I will eliminate all of the chaos in the craft room, but it would be nice to have a tidy area that I am not ashamed to show someone. 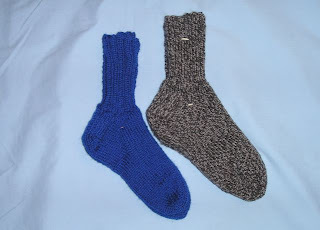 This afternoon I finished a second pair of socks for the afghans for Afghans Youth Campaign. The socks knit up fairly quickly using worsted weight yarn and size 5 needles. I have some more yarn suitable for this project, so I hope to complete at least two more pair before the campaign deadline. Won't you join me in making some socks, mittens, sweaters, or other items named in the campaign information? You can make the difference in the life of a child. The Oddball Baby Blanket project was so successful that it has been split into regional groups: Northeast, Southeast, Midwest Plains, Midwest Great Lakes, Southwest, and West Coast. I am excited to begin anew, but saddened that I will not be in direct contact with some of the ladies from the other areas. It has been exciting to see everyone's knitting talent and to see the blankets grow. The last round of blankets for the old group are just being finished and the finished blankets can be seen here. It is an honor to work on the first blanket for the West Coast group. Desert Sand was started by Ladylou in Colorado, and she sent it to me. The West Coast coordinator is AuburnChick, and she has started a blog to showcase our handiwork. The West Coast region covers the states of California, Colorado, Idaho, Montana, Nevada, Oregon, Utah, Washington, Wyoming, and Hawaii. If you live in one of these states and want to participate, please leave a comment on the West Coast Oddball Knitters blog. All of the regional groups have a thread on KnittingHelp.com and Ravelry, as well. Why not join one of the groups? Knitting on these blankets is a lot of fun, a great way to meet new people, and a wonderful way to help a family who needs some comfort after the birth of their baby. It's finished and ready to find a home. 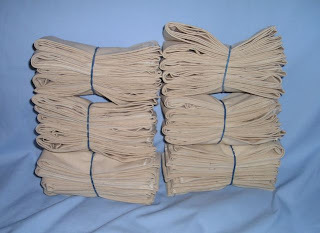 This morning I finished thirty neck coolers, in time to take them to my church. A group will be gathering there this afternoon to make even more coolers to put in the care packages that will be sent to troops in Iraq. These coolers offer the soldiers some relief from the sweltering temperatures. About a month ago, I found nearly four yards of unbleached muslin at a thrift shop for 25 cents and purchased it with the intent to make some neck coolers, but when I got the call yesterday about the care packages I knew I had to get busy. I tea-dyed the muslin, and began working on the coolers. Once I got into the rhythm of assembly sewing, it went pretty quickly. It is hard to believe that these ties only use 1/2 tsp. of the Watersorb crystals. The cooler pattern that I use, requires "medium" crystals. If you decide to make some neck coolers, make sure the crystals that you use do not have fertilizer on them. I am sure the troops appreciate every neck cooler that is sent to them. 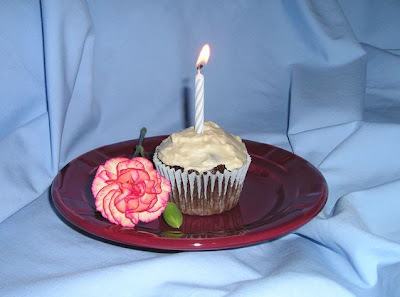 My knitting group met last night, and one of the women brought cupcakes to celebrate three members birthdays - Bea R., Colleen J., and mine. It wasn't until after we had all enjoyed the cupcakes that she told us her secret: the cupcakes were healthy. She had used a recipe from Jessica Seinfeld's book Deceptively Delicious. The moist, devil's food cupcakes were made with an avocado puree, and the cream cheese frosting contained cauliflower puree. These treats were delicious, deceptively delicious, without even a hint of the healthy ingredients. Thank you, NJ for the treats. 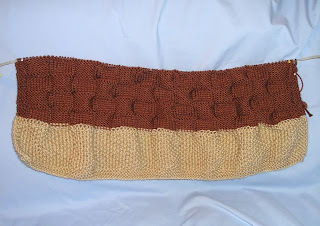 This morning, I was shocked to find a birthday greeting on Renna's blog, Finding My Knitch. Thank you for making my day special, Renna. I had a nagging feeling all morning to go to Lander to check out the thrift shop. I battled with myself. I rationalized that I really didn't need anything to justify driving 75 miles, yet the urge continued. After eating lunch with a friend, I decided to make the drive. I arrived in Lander an hour before the thrift shop opened, so I wandered downtown. I found a fabulous knitting book, The Complete Book of Knitting, by Barbara Abbey in a second-hand book store for $3.00. Even though it is a 1971 copyright and the photos are black and white, it was bargain because it has directions for a lot of knitting stitches. I was happy as I continued meandering down Main Street. I went into Neat Repeat and found three new skeins of yarn, listed as twenty-five cents a skein. That was a good deal, but the skeins were on sale for ten cents each. Wow, now I was really happy. I ventured to the Methodist Church Thrift Shop: a great place that always has wonderful bargains. It is my kind of thrift shop - clean, well stocked, and reasonable prices. I found some spools of thread (10 cents each), an Eddie Bauer dress made out of sweatshirt fabric (it will be yummy for winter -- fifty cents). I was ready to check out when I looked at the bulletin board by the cashier. The board listed the larger items in the storeroom. I was curious and asked to see the sewing machine. 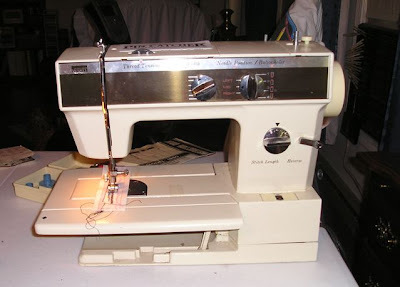 I have a Bernina, but I really hate to use it to make my rugs. The denim strips are hard on the machine, and I thought if I could only find a machine that simply sewed a straight stitch and a zigzag, it would be ideal. In the dusty storage room the machine sat on a table. I slowly turned the machine around and looked it over. Electric cord and foot pedal, check and check. I cautiously asked how much they wanted for the machine, and the lady shyly replied, "Five dollars." Hmmm, did the machine work? She assured me it had been checked. When I saw that the plastic grocery bag included needles, the cam case (yes, this machine uses cams to determine the decorative stitches), and instruction book. I told her I would take it. Since it was all there, I thought it was worth a gamble. When I got home, I oiled the machine generously because it looked like it hadn't been used in years, threaded it, and held my breath as I stepped on the foot pedal. The machine hummed and produced a lovely, even stitch. Tomorrow is my birthday, and this is the best gift I could have found for myself: it was simply meant to be. 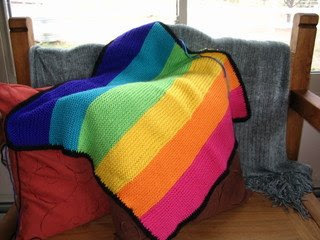 June was a blur, so I forgot to post about the Oddball blanket called, "Neon Rainbow." 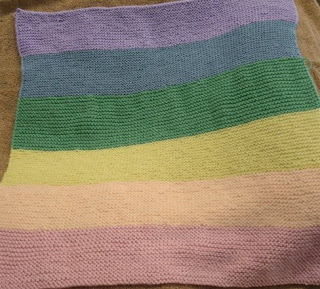 To place the emphasis on the colors of the rainbow, these blankets are knit in garter stitch. I added the Lime Green section early in June and sent the blanket on before I left on my trip. 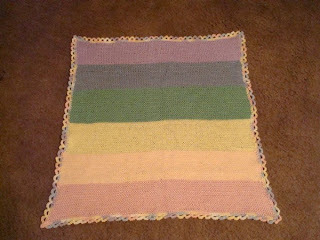 This week, a photo of the finished blanket was posted on KnittingHelp.com. I think you will agree that this Oddball Blanket is a real stunner. A more subtle rainbow, Pastel Rainbow, also stopped in Wyoming on its journey. My section was pastel yellow. 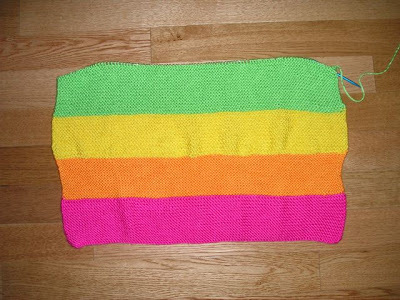 While not as bright as its Neon cousin this blanket will also be a beauty. 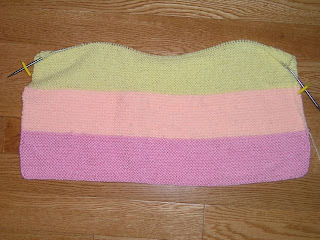 Pastel Rainbow is complete, sans crochet edging. All Crafts for Charity, an online Yahoo Group, "adopted" my hospital nursery for two weeks in June. Thanks to the generosity of these talented ladies, I have been busy opening packages, creating a data base, and preparing the items for the hospital staff. You can see all of the beautiful items that I received here. Earlier this year, I was grumbling because there was no way I could knit enough hats or sew enough blankets or purchase the necessary materials by myself to keep this project viable. 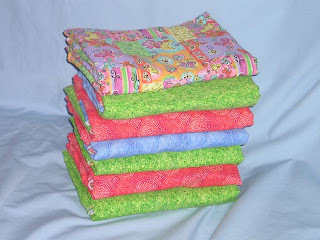 God used the All Crafts for Charity group and its generous and talented members to provide for the babies in my area. Praise God and Thank You, ladies! 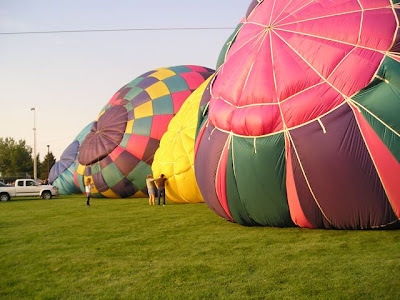 One weekend a year, my town hosts a small balloon festival that corresponds with numerous local reunion activities (family and school). 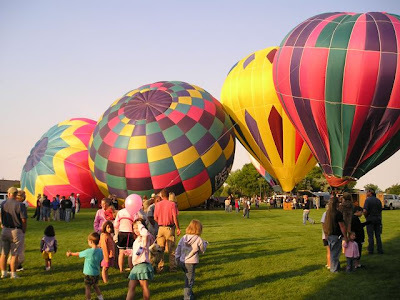 I usually get up early on Saturday morning to take part in the annual balloon festival launch. 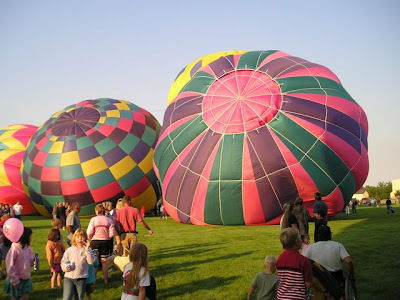 This was the 28th festival that my town has hosted, and I've attended many launches over the years because I love to wander the field as the giants are inflated. No matter how many times I attend the small festival (compared to the rally in Albuquerque, the festival is tiny with only 30 - 40 balloons) but the crowds are always huge. I am always captivated by the sheer size and beauty of the balloons. 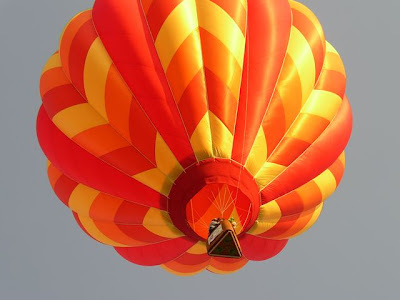 My town has two hot-air balloons (Cloud Kisser and Cloud Kisser II) that are flown in various balloon festivals throughout the area to promote the town. It is awesome to watch the crews prepare the balloons for flight. Standing amid the growing envelopes of air is heavenly, and when one by one they ascend into the warming atmosphere at various levels, I can only gape in wonder. I would love see this event through a child's eyes. At the signal, crews unroll the balloon envelope on the ground. ever so slowly, the balloons mushroom to life all around. 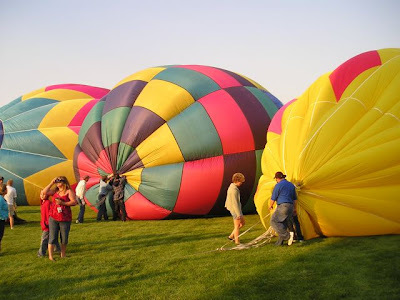 The balloons politely bump and jostle for position in the cramped area until they are standing upright. They continue to grow until the crowd begins to wonder if they will ever get off of the ground. 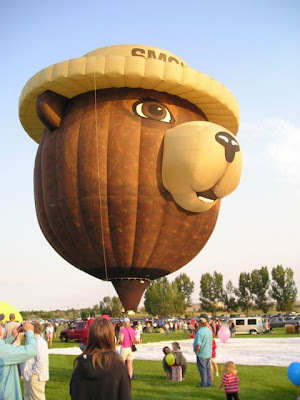 This is the Smokey Bear balloon, sponsored by the The Wind River Fire Prevention Council. 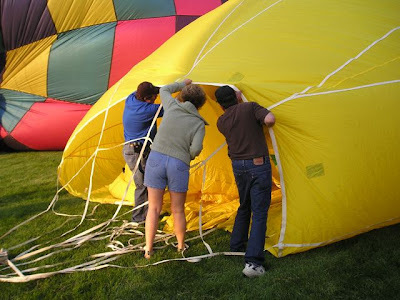 The balloon is inflated with the nose on a protective cloth, so the face cannot be seen until the balloon is fully inflated. Oh, how the children love to watch this balloon come to life. Sometimes rides are offered to people in town during the two-day event. 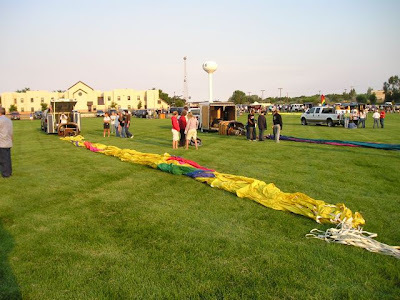 It is very common to see the large balloons maneuver to land in a vacant lot or in the middle of an intersection to pick up passengers. I'd love to be up there soaring in the sky, drifting along without a care. I'd put that at the top of my "Bucket List." Wyoming Vacation or Business Trip? 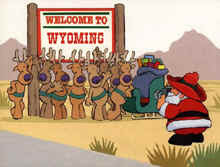 It appears that Santa and the boys are not bothered by the rising cost of gasoline and have been vacationing in Wonderful Wyoming. Their trip was probably timed to coincide with the current Christmas in July sales that are beginning to materialize. Hallmark ornaments will be revealed either this weekend or next. Hobby Lobby, Michaels, and JoAnn's are stocking their shelves with Christmas goods. Soon WalMart and Kmart will begin preparing for the season, and the countdown will begin. I do almost all of my Christmas shopping throughout the year, catching sales when I can. Doing this helps me to avoid the frenzied crowds in November and December, and I save a ton of money. My shopping for this year is nearly complete, and I found some great items for very little money. Planning ahead helps me to stay focused on Christmas as it was originally intended. 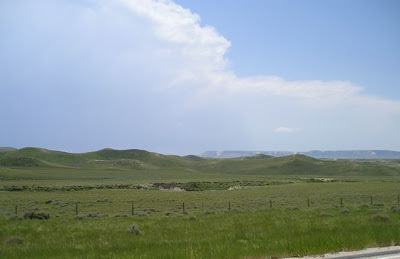 This is the Shirley Basin cut off between Laramie and Casper, taken on my drive home last week. Hopefully this illustrates why I love Wyoming so much. I haven't been doing much this past week except recharging from my two week trip. The knitting needles have been idle, and the house is a mess. Yesterday, I did manage to clear off the piles mail on the kitchen table and even finished reading Forbidden by Suzanne Brockmann. A member of my knitting group loaned me the book over a month ago, and on Tuesday was eager to see what I thought of the author. I was ashamed to tell her I hadn't read it. The book was a quick summer read, very enjoyable. In fact, I enjoyed it so much that I started reading the other book she gave me Gone Too Far by the same author. I cannot remember the last time that I actually read a book: I have been spoiled by audio books because I can knit while I "read." The purchases I made on my recent trip included two knitting stitch books. I looked for the perfect book in Hobby Lobby, JoAnn's, Barnes & Noble, Border, etc. and finally decided to purchase Big Book of Knitting Stitch Patterns and a Leisure Arts leaflet simply entitled, Beginner's Guide Knit Stitches & Easy Projects. The Big Book shows two patterns per page and the photographs are clear, close-up, and in color. 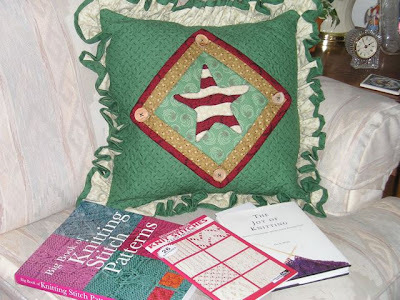 Over 550 stitch patterns (written directions and charts) are included in this book. I feel it is the most comprehensive stitch book that I could buy for the price. I purchased the other stitch book because of its size (about 5 x 7 inches), thinking it would fit nicely into my knitting bag. It contains a modest 26 stitch patterns, and the photos are black and white. The project patterns in the book include: basic mittens, men's muffler, two pillows, baby & full-sized afghans, and a cropped cardigan. It also has some general knitting instructions for the beginner. It is a good value and a nice reference book for any knitting bag. I did not purchase The Joy of Knitting by Lisa R. Myers, but rather won it. It arrived in today's mail, and I hope to spend some time reading over the long, holiday weekend. I have only leafed through the book, but it appears to cover knitting history, selecting fiber, and twelve project patterns (one for each chapter), along with general knitting instructions. It should be a good read and a nice reference book. More later on The Joy of Knitting.